Osteoporosis is a condition in which your bones become weak and brittle and more likely to break (fracture) than normal bones. Osteoporosis is the result of bone mineral (mainly calcium) loss, which occurs commonly as we age. Osteoporosis is a common cause of fractures in older Australians, especially women. In women, the greatest rate of bone loss occurs in the years immediately following menopause. Your peak bone mass is reached by the age of about 30 years. Everyone loses bone as they age, but not everyone gets bone thinning to the point that they have osteoporosis. Although genetics and gender play important roles, research has identified key, life-long preventive measures — such as having enough calcium in your diet every day, and doing weight-bearing and resistance (weight-lifting) exercises regularly — that can help avoid osteoporosis. Regular weight-bearing exercise in children and teenagers helps produce strong bones; in adults it helps to maintain bone mass; after the menopause it can be part of an overall treatment plan that aims to slow the rate of bone loss; and in adults over 65 years physical activity can be used to both reduce the rate of bone loss and avoid injury to bones by improving muscle strength and balance. The strength of your bones also determines the type of exercise that is appropriate and safe for your bones. If you already have osteoporosis or other medical conditions, you are over 60, or you are over 45 and have not exercised regularly in recent times, speak to your doctor about designing an exercise programme that is suitable for you. Note. The exercises discussed here are designed for healthy adults who have healthy bones. Exercises that make your body work against gravity, such as running, brisk walking, stair climbing, dancing, tennis or netball, are good options for promoting healthy bones. Each time your foot hits the ground you apply a stress to your bones, which respond by maintaining or sometimes increasing their strength, which can be measured in terms of bone mineral density. The higher the impact of the activity contact, the greater the benefit to your bones. This is why weight-bearing exercises that include running or jumping (for example, jogging or rope skipping) are of greater benefit to your bone health than gentler weight-bearing exercises such as walking. By itself, relaxed-paced walking does not increase bone density or reduce your risk of fracture, but it can be a good way of starting if you haven’t exercised for a long time. Jumping is a simple weight-bearing exercise that can help build up your bones. It can easily be fitted into your day, with just a couple of minutes per day being useful. You can jump while holding on to a rail or another person if you need support. Experts advise working up to approximately 50 jumps of about 8 cm in height, 3–6 days per week — you can jump on the spot, use a skipping rope or jump from a step or box. As you get stronger you can jump higher and build up to hopping on one leg. However, jumping and hopping are not suitable for people with osteoarthritis — ask your doctor about other weight-bearing exercises that will work for you. To maintain the bone-strengthening benefits of weight-bearing exercise, you need to keep up the exercise regularly, for the long term. If you stop exercising, the benefit wears off. Experts advise 45–60 minutes of weight-bearing exercise 3 days per week to increase the strength of your bones. Exercises such as swimming and cycling, although good for aerobic fitness, are not so helpful for strengthening your bones because they aren’t weight-bearing. Balance training is an important part of looking after your bones. Working on your balance can improve your stability and help prevent falls, which is important because falls can cause fractures. balancing with a pillow or rocker board under your feet. Start with a balance exercise that you find easy and work up to those you find harder — you can also challenge yourself by closing your eyes during exercises that you’ve mastered. Resistance exercises, such as ‘weight-lifting’, are another good way of strengthening your bones and building strong muscles. Resistance exercises can involve weights that you hold or have strapped to you, or resistance machines where you use a programmed weight. Alternatively, some resistance exercises use your own body weight as the load. Doing a programme of resistance exercises 3 days a week has been shown to help maintain healthy bones. First, check with your doctor whether the exercises shown here are suitable for you. This is especially important if you have other medical conditions, or you are over 45 and have not exercised regularly in recent times. These exercises are not designed for people who already have osteoporosis. Do not go ahead with these exercises if you already have osteoporosis — instead, see your doctor for an exercise programme that is suited to your needs. 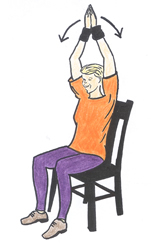 For this exercise programme you’ll need a sturdy chair (without arms) that has a high back, approximately level with your waist. If your chair is the correct size, when sitting with good upright posture, your bottom should rest against the back of the chair while your feet are flat on the floor and the backs of your knees touch the seat of the chair. You’ll also need a pair of portable or strap-on wrist weights and a pair of strap-on ankle weights. When starting out, use the lightest weights you can lift comfortably. However, you will need to increase the weight as you grow stronger. This is vital for building strength. Wear comfortable, non-restrictive clothing, thick socks and comfortable exercise shoes. Warm up first by doing a repetitive, gentle movement such as walking for a few minutes or slowly going through the motions of a couple of the weight-training exercises, minus the weights. This helps circulate blood to your muscles and reduce the risk of an injury. Perform each exercise slowly 8–10 times. A slow repetition means taking about 3 seconds to lift the weight, 1 second to rest, then 3 seconds to lower the weight. Repeat for the opposite leg or arm, where necessary. These 8–10 repetitions make up one ‘set’. An exercise session should consist of 2–3 sets each of 6–8 different types of resistance exercises. It’s best to rest for 10–14 seconds between repetitions. Remember to breathe regularly during these exercises. For example, take a deep breath in, then breathe out slowly as you lift the weight; breathe in as you lower the weight. Do not hold your breath while lifting or lowering the weight. You should need to use strong effort when lifting the weights in these exercises, but remember to stay within a range of movement that does not cause you pain. After you have completed all the exercises in the sequence, gently stretch, in turn, all of the muscles you have just worked. Do these resistance exercises on 3 days of the week, always allowing a non-weight training day between weight-training days, so that your muscles can recover. Do not increase the weight that you lift until you can easily complete the 8th repetition of an exercise. Gradually add enough weight to challenge your muscles, so that it feels hard or very hard to complete the repetitions. When you can lift a weight 8–15 times, then add more weight to challenge your muscles again. Repeating this process will help build strength. Make sure you don’t overdo it, however: if you can’t lift a weight 8 times in a row, it’s too heavy for you so use a lighter weight. As you get stronger, you can try lifting the weight rapidly and lowering it slowly. This maximises the benefit to your bones. Talk to your doctor or a qualified fitness professional to make sure your exercise programme is right for you. 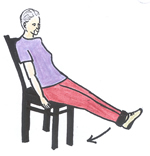 Wear ankle weights for this exercise if you can comfortably support the weight. Rest both hands on the back of your chair for balance. Lift your heels and rise up on the toes of both feet, hold, then slowly lower your heels. As you become stronger, you can rise up on one foot at a time, while you hold your other foot slightly off the ground. Wear ankle weights for this exercise if you can comfortably support the weight. Rest both hands on the back of your chair for balance. Bend one knee and slowly lift this foot backwards, off the ground, while keeping the thigh of this leg still. Try to reach your foot towards the back of your thigh, hold, then slowly lower your foot to the ground. Repeat for the other leg. Wear ankle weights for this exercise if you can comfortably support the weight. Rest both hands on the back of your chair for balance. Bend forward at the waist so that your torso is leaning towards your chair at about 45 degrees. Slowly lift one leg backwards while keeping your knee straight. Lift as high as you can without losing balance and without bending further forward. Hold, then slowly lower your leg. Repeat for the other leg. Wear ankle weights for this exercise if you can comfortably support the weight. 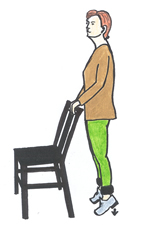 Stand side-on to the back of your chair, resting one hand on the back of the chair for support. Raise one knee towards your chest with your leg bent. Keep your back and waist and other leg straight. Hold, then slowly lower your leg. Repeat for the other leg. Wear ankle weights for this exercise if you can comfortably support the weight. Rest both hands on the back of your chair for balance. 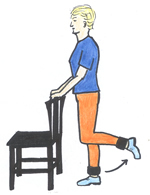 Lift one leg slowly to the side with your knee straight. Hold as high as possible without losing your balance, then slowly lower to the ground. Repeat for the other leg. Wear ankle weights for this exercise if you can comfortably support the weight. Sit on your chair with good upright posture, your bottom against the back of the chair and your feet flat on the floor. Now hold onto the sides of the seat for balance and slide your bottom forward towards the front of the seat. Rest your shoulders against the back of the chair for support. Slowly raise both legs 5-10 cm off the ground with your knees straight and your feet together. Hold, then slowly lower your feet to the ground. Wear ankle weights for this exercise if you can comfortably support the weight. Sit on your chair with good upright posture, your bottom against the back of the chair and your feet flat on the floor. Hold onto the sides of the seat for balance. Raise one foot slowly forward, aiming to straighten your knee as much as possible, while keeping your thigh on the chair. Hold, then slowly lower your leg. Repeat for the other leg. Wear wrist weights for this exercise if you can comfortably support the weight. Sit on your chair with good upright posture, your bottom against the back of the seat and your feet flat on the floor. Starting with your hands by your sides, slowly lift both hands outward, tracing a large circle that allows your hands to meet overhead, in a ‘prayer’ pose. Hold, then slowly lower your hands to your sides by retracing the same large circle. Wear wrist weights for this exercise if you can comfortably support the weight. Sit on your chair with good upright posture, your bottom against the back of the seat and your feet flat on the floor. Raise both arms either side of your head, with elbows slightly bent. Bend one elbow so that your wrist moves down behind your head to the base of your neck (avoid bending your head forwards). Hold, then slowly raise your wrist to be level with your opposite wrist. Repeat for the other arm. Wear wrist weights for this exercise if you can comfortably support the weight. Sit on your chair with good upright posture, your bottom against the back of the seat and your feet flat on the floor. Rest your hands on either side of the seat. Bend the elbow of one arm to raise your hand towards your shoulder. Hold, then slowly lower your hand. Repeat for the other arm.